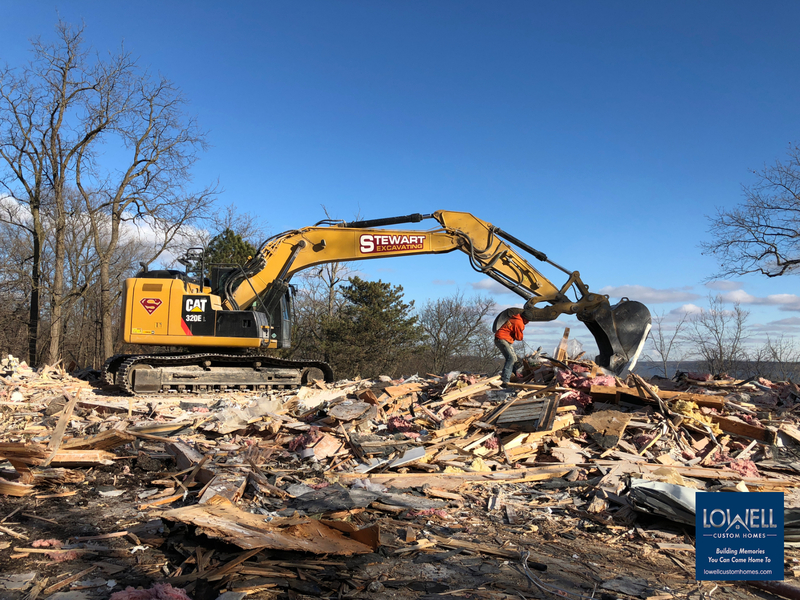 When part of the building process includes clearing the way for new construction, we approach the task in the most socially responsible way for our community and the environment. 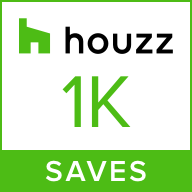 With the approval of our homeowners, we called in Milwaukee Habitat for Humanity for this extraordinary project. The process of deconstructing a home and donating the materials to Habitat is fascinating! So are the countless people who volunteer and make it all possible! It all starts bright and early with a crew of over 30 volunteers, 2 trucks and buckets of tools. Cindy Gear, volunteer Deconstruction Product Processing Leader, meets with Scott Lowell to review the days activities including a recap of items to be donated and the “do-not-take list”. We learned from Cindy that to volunteer at Habitat one must be relatively handy, the crew members actually brings their own tools. 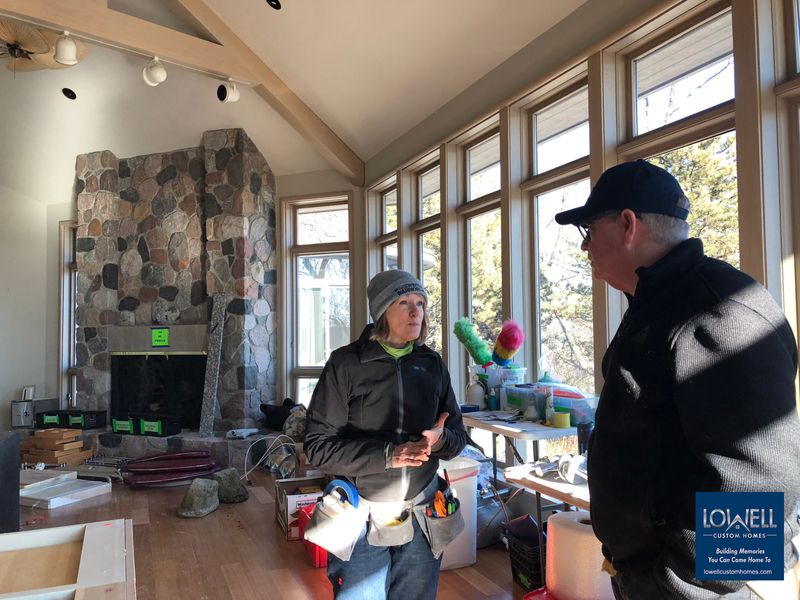 Most volunteers are retired or have part time business interests, and all are dedicated to the task of providing quality homes and products to the community. 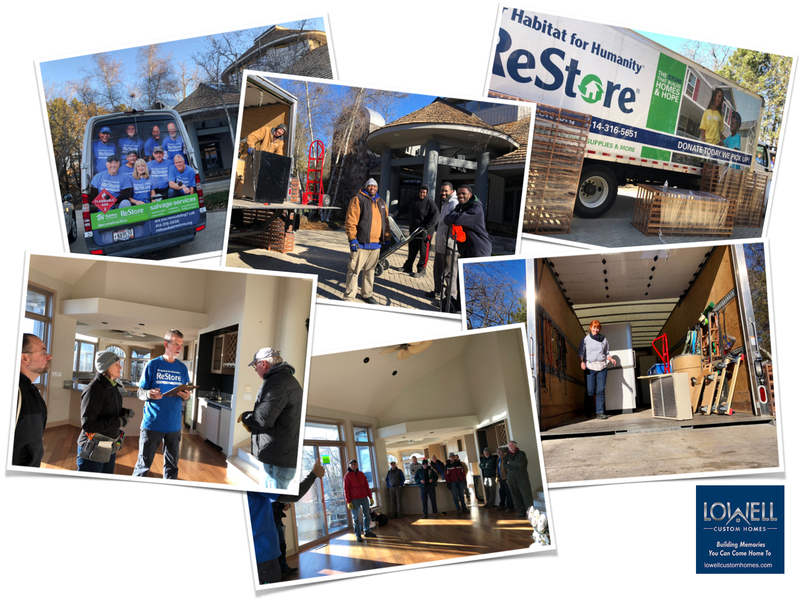 One of the most interesting tidbits we learned – every item is sorted, cleaned, priced packaged and entered into inventory before it is even loaded on to the ReStore Milwaukee truck. Typically donations hit the sales floor the same day! That makes products and materials available to savvy shoppers asap! The proceeds are used to “build homes, communities and hope locally and around the world”. 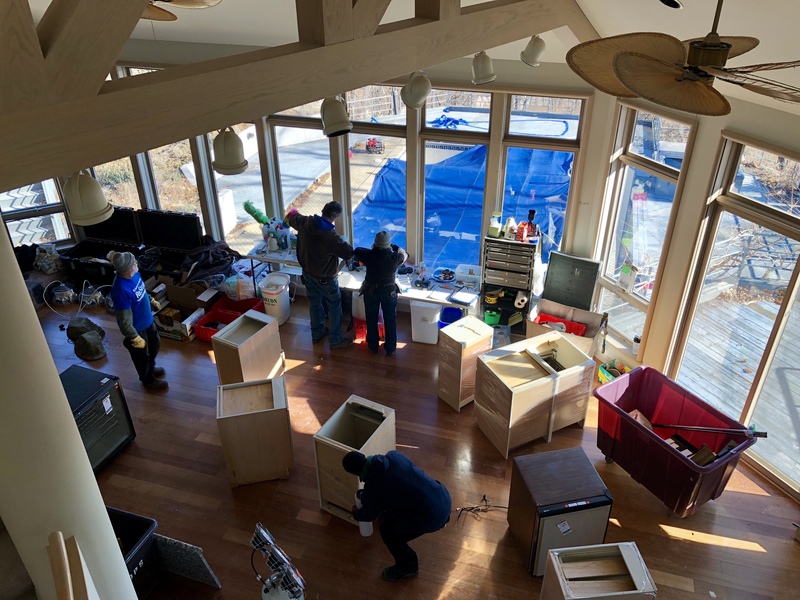 Along with plumbing, lighting and appliances, this donation included high quality Wood-Mode Cabinetry, and SubZero refrigerators. All contributed by our very generous homeowners! 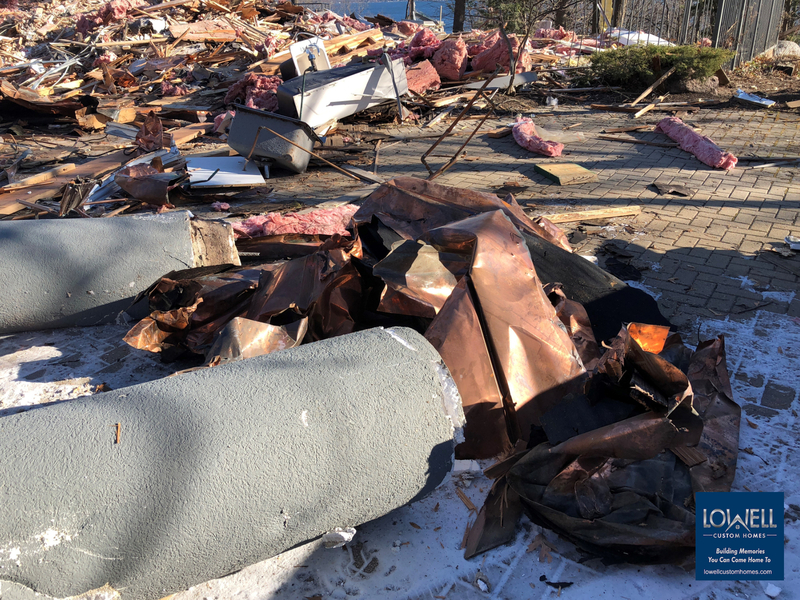 On demolition day, a careful salvaging process is used for materials that will be reused or recycled. Watch this fancy bucket-work from excavator Bobby Stewart as he starts by dismantling the stone fireplace and carefully removing the chimney piece. This is aluminum and can be reused or fully recycled. The decorative face stone is removed and can also be reused. Concrete blocks that form the structure along with other concrete will be broken to small bits and recycled to use as road bed. 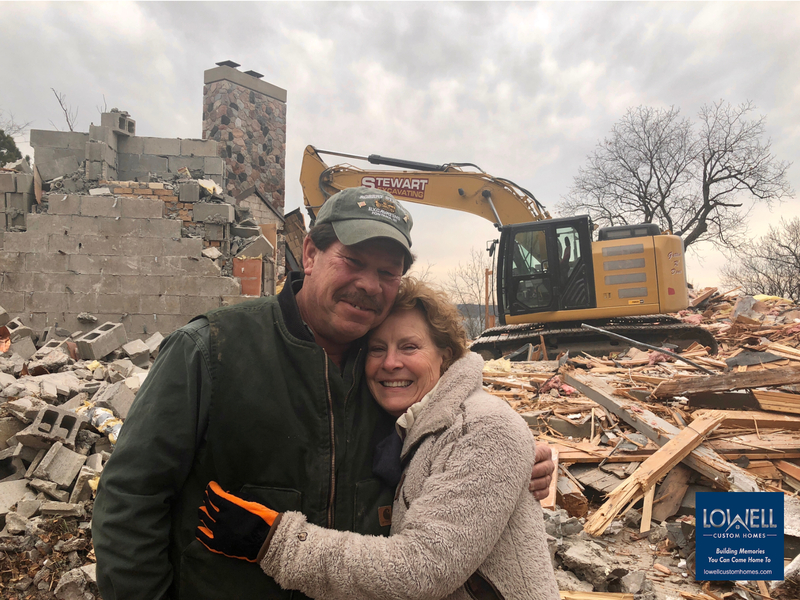 Amidst the deconstructed material, Melissa Lowell pauses for a hug from an old friend Bobby Stewart! Stewart Excavating has been a part of the Lowell Custom Homes family since Day 1! While this may look a bit messy, there is a method to the work that is focused on identifying and separating material for recycling. Workers pull wire, copper and other metals from the debris. Ductwork, appliances, air-conditioners can all be sent for recycling. 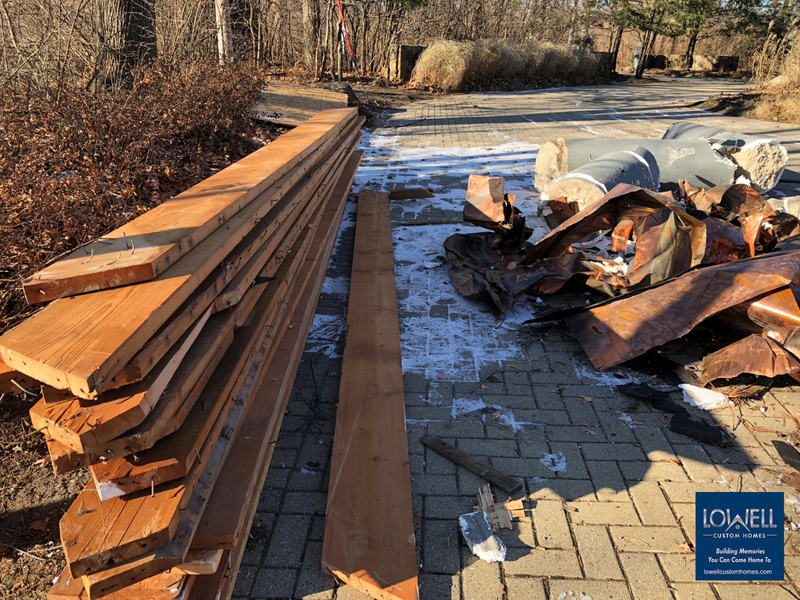 Steel beams can be reused if not bent or be scrapped for recycling. Undamaged lumber is stacked for reuse. Copper is one of the worlds most recycled and reusable resource. 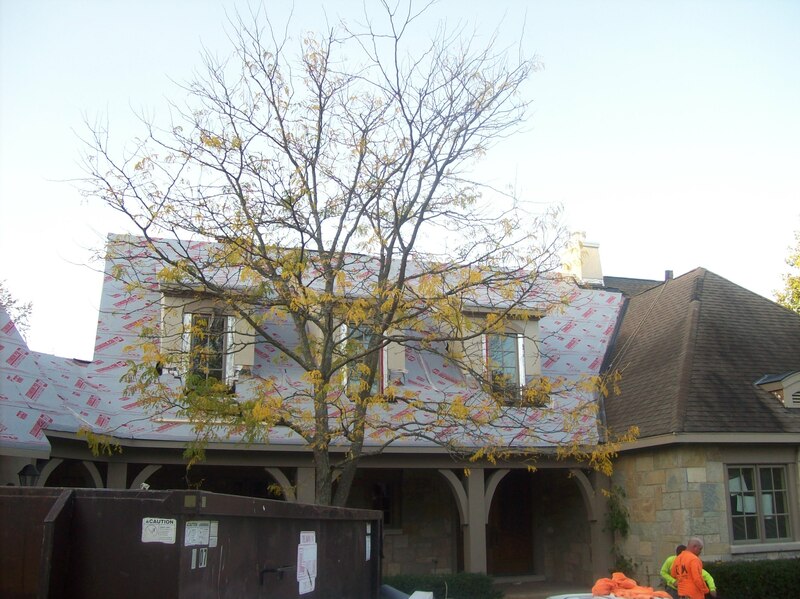 When remodeling we remove roof shingles and place them in a designated dumpster for recycling. Before and during construction, we take steps to preserve the surrounding landscape. This is critical for property adjacent to the wetland areas in Lake Geneva. 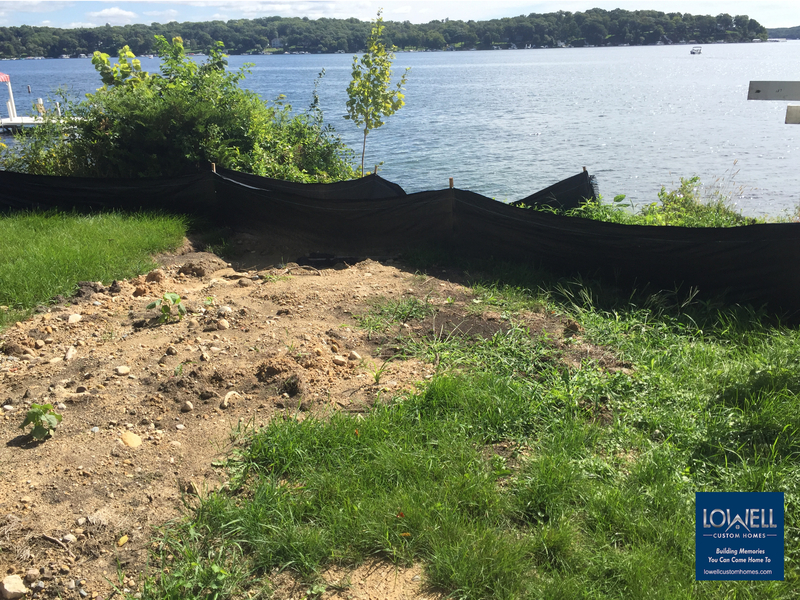 We work with Conservancy to implement the best practices for erosion control using silt fence and straw bails to slow water run off to the lake and reduce sediment. Once material has been reclaimed, it can contribute to some of the most intriguing architectural details. 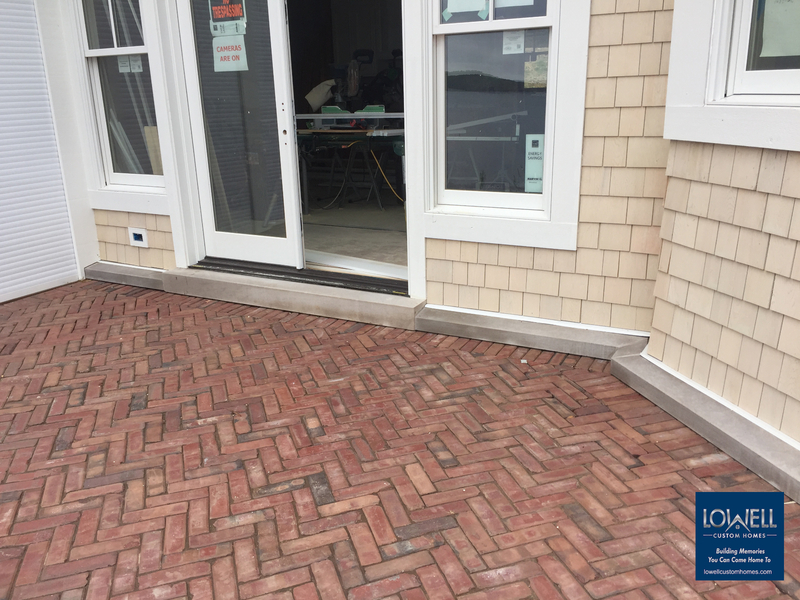 This antique reclaimed brick from an old midwestern street has a rich history, it will be a definite conversation starter when the homeowners entertain on their terrace. 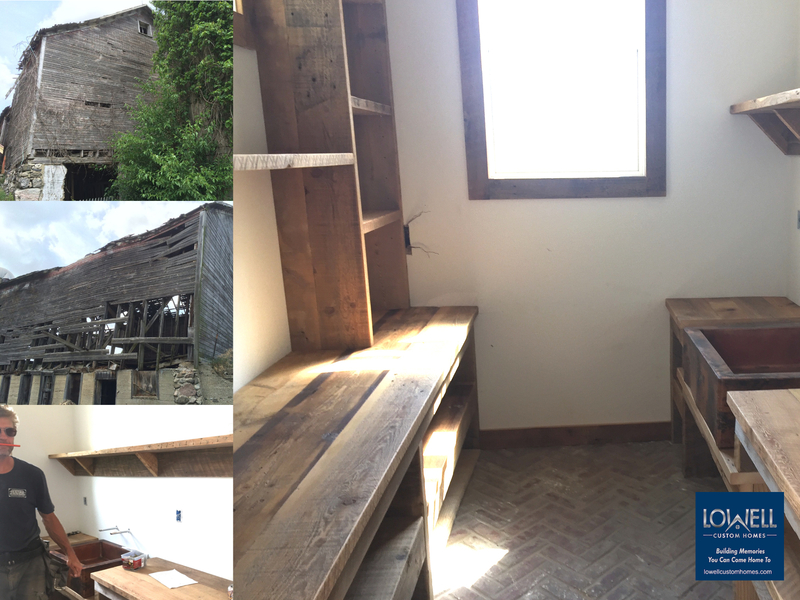 One of our favorite sources for reclaimed material is Heritage Beam & Board in Elkhorn, WI! The backstory for this reclaimed lumber is touching and meaningful. The Hubbard family farm has endearing memories connected to the barn they called The Grand Queen and now the barn boards lives on to create memories for an entirely new family. Lake Geneva is rich in opportunities for families to build and establish a home that is beautifully integrated into the natural surroundings. We take on our role in this process enthusiastically and continue to advance our socially responsible commitment to the community. 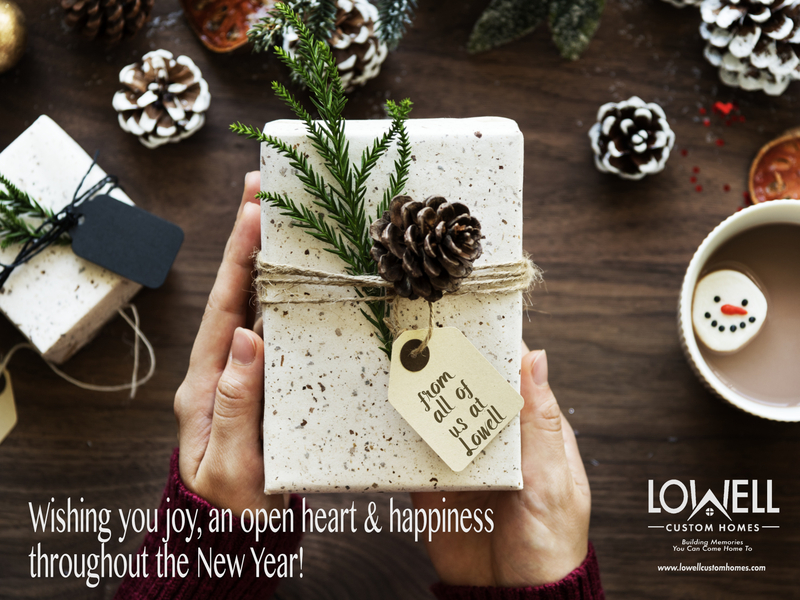 https://www.lowellcustomhomes.com/wp-content/uploads/2017/12/demo-day.png 898 1193 Lowell Custom Homes /wp-content/uploads/2018/02/lowell-custom-homes-logo-250.png Lowell Custom Homes2017-12-23 00:09:252019-01-04 13:28:57Deconstruction, Reuse, Recycle - The Alternative to Demolition.